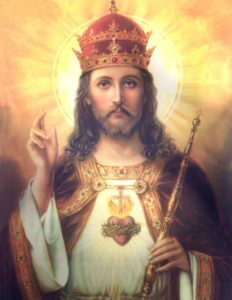 Litany to Christ the King - My Catholic Life! To Him be glory and empire forever and ever. He shall rule from sea to sea, and from the river to the ends of the earth. All kings shall adore Him, all nations shall serve Him. Lord, have mercy upon us. Christ, have mercy upon us. Lord, have mercy upon us. Christ the King, hear us. God, our Heavenly Father, Who has made firm for all ages your Son’s Throne, Have mercy on us. Jesus, King of All Nations, Who after having destroyed every sovereignty, May we serve You. Eternal Father, Who has given us Your Only Begotten Son, to be our Redeemer, One True Mediator, and Sovereign King, We praise and thank You. Loving Jesus, Sovereign King, Who humbled Yourself for Love of us and took the form of a servant, We praise and thank You.